STEM Summer Camp challenges the minds of young people with an interest in science, technology, engineering, or math (STEM). This year’s camp, held at WestGate Academy Conferencing and Training Center (June 13-July 8), offered many activities to children in grades 2nd – 10th. NSWC Crane Coordinator, Tina Closser explains why she believes the camp is important. In the starting weeks, attendees were able to take part in many educational projects. Children in grades four through six exhibited their skills during the tinkerCAD challenge where they were able to construct their own prototypes through 3D design. The children also displayed a fascination for the Rube Goldberg machine design project. The objective was to create an over-engineered apparatus using different simple machines within their own groups. The finished designs were later put to the test and displayed for the rest of the groups. Other projects conducted by this group of children include, the bee dance, snap circuit activities, skull activities, battlebots, and crash test dummies. Sixth grader from St. Vincent DePaul Catholic School, Ellie Plew puts her excitement into words. Students in grades seven through ten were also challenged with the Rube Goldberg machine design project as well as many other engaging tasks. These challenges include engineering design process implementation, 3D printing, spaghetti marshmallow towers, electronics, and Arduino (involving digital devices and interactive objects). Throughout their week at STEM Summer Camp, this particular group of scholars learned the importance of teamwork, documentation, and communication while building a website to record their experiences. Seventh grade Youtuber from Jackson Creek Middle School, Blaise Oeding explains how STEM Camp can prepare students for a future career. As STEM Summer Camp came to a close at WestGate Academy, second through third graders focused their minds on the BIG IDEA. This was a step by step process that allowed the students to receive a better understanding of conducting experiments and recording results. During this time, the children picked a plant or animal that they would study and use to answer the question, “How could their external parts solve a human problem?” In addition to the BIG IDEA, the students also tested their knowledge with footprint puzzles, fossil activities, tinkerCAD, erosion activities, and model developing. Camper and Helper, Jenna St. John gives an explanation as to why she decided to return and help with the younger students at STEM camp. 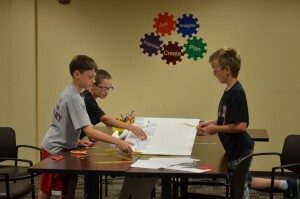 This camp was a great way for young students to gain knowledge about STEM throughout their summer break. Careers in these fields are significant to the community, therefore it is important to give those with an interest the tools necessary to excel in the future. Learn more about Paige here.